Shop for your favorite skincare products now with all these amazing deals! 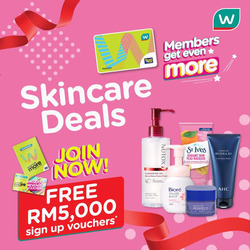 With great member discounts and FREE RM5,000 vouchers when you sign up as a Watsons member! Watsons is the largest health, beauty and personal care chain store in Asia. Do you want to receive more offers from Watsons by email?